Dr. Chaiken currently serves as a consultant for Atlanta Hearing Associates, a private practice with four locations in Georgia. She is a leading expert in cerumen management and travels extensively providing training for students and audiologists alike. Dr. Chaiken is an Adjunct Professor of Audiology at Salus University and was named the 2014 Salus University College of Audiology Alumnus of the Year. Her previous experience includes founding a private audiology practice, which she owned and operated for 12 years. Dr. Chaiken also served as a regional manager for a hearing instrument manufacturer for three years. Dr. Chaiken has been a member of ADA since 1981 and a member of the ADA Board of Directors since 2010, where she currently serves as Secretary. 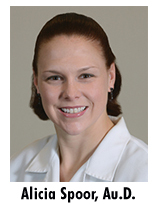 Alicia Spoor, Au.D., has been re-elected to the ADA Board of Directors to serve as a Director-at-Large. Dr. Spoor is employed at A&A Hearing Group, a private practice with seven locations throughout Maryland. Dr. Spoor also serves as the Chair of the Audiology Quality Consortium (AQC), a coalition of 10 audiology member organizations committed to collaborate on the development, monitoring and implementation of audiology quality measures for use in the Centers for Medicare and Medicaid Services (CMS) Physician Quality Reporting System (PQRS) and with other health care payers. Ram Nileshwar, Au.D. has been elected to the ADA Board of Directors to serve as a Director-at-Large. 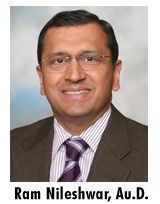 Dr. Nileshwar is the President and founder of The Hearing Center of Lake Charles in Lake Charles, Louisiana where he as practiced for nearly three decades. Incoming board members and officers will be installed to their new positions at ADA’s Annual Membership Meeting to be held at the ADA Annual Convention on Friday, November 7th, at 4:35 p.m. at the Red Rock Resort in Las Vegas, Nevada.